Nerf War PART 2 with a Sleepover!!! Nerf War 2.0! Come join us for an awesome time, a few team elimination games, capture the belt, and some other surprises! 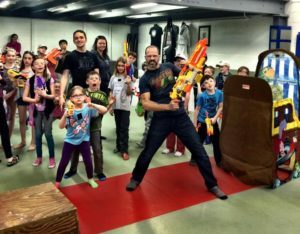 We will also be having an end of year sleepover after the nerf battle, where the kids will be given a snack and watch a movie while sleeping at their favourite martial art studio. Great time to drop off the kids and go for a date night!!! Previous PostSummer Student Special!Next PostLIMITED TIME OFFER FOR NEW MEMBERS! Fill out the following information and one of our support staff will get back to you ASAP to book your Free Trial Class. Sudbury BJJ & Muay Thai Academy Sudbury BJJ & Muay Thai Academy shared a post. Even the Easter bunny knows when it's time to step up and defend! Sudbury BJJ & Muay Thai Academy Sudbury BJJ & Muay Thai Academy shared a photo. Hanmer Kettlebell Bootcamp New Year Special!